During Egypt’s New Kingdom Period, in the 18th dynasty, Amenhotep III (ca. 1390-1352 BC) commissioned hundreds of statues of the goddess Sakhmet for his mortuary temple in western Thebes. These statues were intended as monumental prayers to appease the goddess and guarantee peace and health. Goddess Sakhmet. Metropolitan Museum, NY. Photo by Leon Mauldin. “The goddess Sakhmet represents the forces of violence, disaster, and illness. 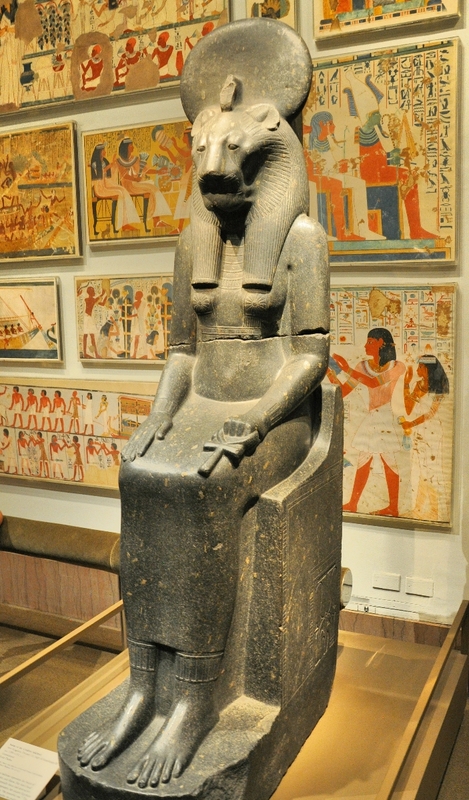 Her lion’s head expresses her potentially fierce and destructive character and, appropriately, her ancient Egyptian name, Sakhmet, means ‘the powerful one.’ The sun disk on her head identifies the goddess as the daughter of the sun god Re” (from museum placard). This puts me in mind of what YHWH said prior to the 10th of the ten plagues of Egypt: “and on all the gods of Egypt I will execute judgments: I am the LORD” (Ex. 12:12). This entry was posted on Thursday, October 9th, 2014 at 8:48 AM and is filed under Bible History and Geography, Bible Study, Biblical Interpretation, Egypt, Old Testament, photography, Travel. You can follow any responses to this entry through the RSS 2.0 feed. You can leave a response, or trackback from your own site.